It's really disappointing to see that Google doesn't provide an option to migrate your videos to YouTube. In fact, this option should've been available two years ago, when Google Video became a search engine. There are about 2.8 million videos hosted by Google Video and it's hard to believe that all of them will be manually uploaded to YouTube. Google Video is an archive of high-quality videos: there are many documentaries, interviews, lectures and it's sad to see them disappear. Even if Google Answers was discontinued in 2006, the archived content is still useful. If anyway finds a way to download "blocked" videos, please let me know. Google Video has provided no way to retain these videos and fix copyright infringements. Many of these videos probably could be uploaded to YouTube and just have ads run over them with no problem. Instead of deleting, Google should transfer the videos to YouTube instead of wiping out them all forever. WTF. For google to do this is just so depressing. Third-rate operations like yahoo, sure, but for google to delete its users data? Shocking. Jason Scott right again about the cloud. You can use a video download add-on for FireFox and get them all. Do you have a name or link? I don't think any will get blocked videos. Google doesn't own the rights to these videos, so they just can't transfer them. It would be to much trouble for them to get permission from every uploader. A migration option to YouTube shouldn't really be a problem for Google. Moreover redirect links to the new YouTube videos not to break links. 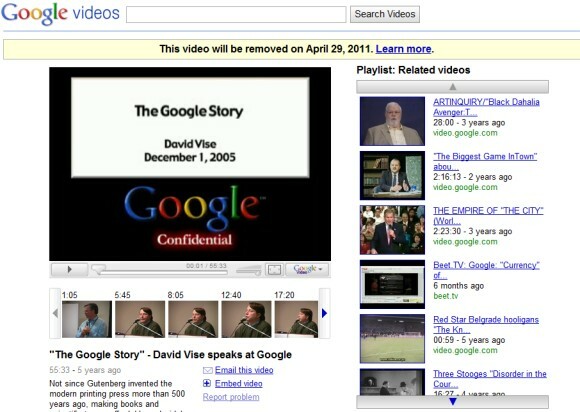 Really sad to see big web companies like Yahoo!, BBC and now Google to destroy web content and web history. especially now that youtube demands a google account (to have an account on youtube or merge your youtube account), i don't see why they cant simply move everyone automatically, its just a question of making an account if there isnt one to move the stuff over? or if god forbid they are too uptight about copyright and agreements, well move then over but leave them private, so the user can choose to publish or not, problem solved. The copies that google video did keep available for download were of very poor quality and hence not really of archival quality. But if it is the only remaining copy of the video, it should be preserved. I uploaded videos, but I had backups of most of the originals saved elsewhere, but it is more inconvenient to track down than when it was online. I suspect I will upload to google docs, picasa or youtube manually if I get around to it. One thing I noticed is that the *.flv files from google video are recognized as video files when uploaded to google docs. Why doesn't Google automatically transfer the videos? Google has been bought out. As of today, Google introduced an option to migrate the videos to YouTube: An update on Google Video - Finding an easier way to migrate Google Video content to YouTube. Did anyone else get an email from Google saying that they are no longer removing the videos and will migrate the links to point to automatically converted YouTube versions eventually? Well, given that they can't decide what the product's called (Google Video or Google Videos), why the surprise? 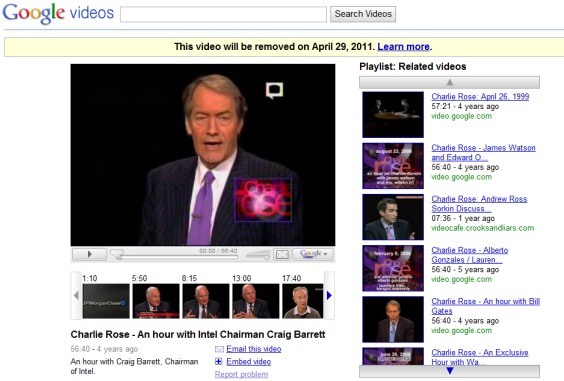 Does anyone know a way to permanently DELETE a video on Google video that is still playable as of Oct. 2011 ? It is our own video but we need it taken down for our own in-house legal reasons. There is no editing option on the Google video any longer so we cannot delete it or disable it. Any ideas ? I also need help REMOVING a video that we posted but no longer have access to. Please help! agreed the ability to take down videos that are not attached to any youtube or google account but are your property is desperately needed.